July | 2011 | Go Resorting! As I blogged about yesterday, this week we are fortunate to have Jennifer from Breakfast Television Toronto coming up north from the big city to some resorts this week. After her stay at Couples Resort on Sunday night for the broadcast on Monday morning, she moved on to Deerhurst Resort in Huntsville. With the increasingly hot temperatures this week, BT did a great job of showing off beautiful Peninsula Lake as the perfect way to cool off. Chef Rory Golden was on hand to show some of his culinary creations preparing a delicious looking arctic char with a maple sauce. Deerhurst produces their own maple syrup from their 800 maple trees on site. In addition they grow their own herbs and spices as well as having bee hives for honey. New at Deerhurst is the one the lake water park “Splash Zone,” which is the perfect way to cool off. They also have the adventure activities on site such as hummer tours through the beautiful Muskoka landscape. In the winter there is skiing, snowmobiling, golfing on one of their two courses etc. Of course there are also the relaxing activities such as the spa treatments available through Deerhurst Shizen Spa. Deerhurst is a beautiful all season resort and we encourage you to come on up to experience all the Deerhurst and Muskoka has to offer. Resorts of Ontario and some of our properties are happy to welcome Breakfast Television up to our place this week. On Monday morning Breakfast Television’s Live Eye was on location at Couples Resort located on the Eastern Side of Algonquin Park. Jenn did a fantastic job of showcasing some of the great activities available for guests staying at Couples Resort such as Horseback Riding, Spa treatments, fishing, canoeing, or just relaxing in your suite. While there, Jenn also got to experience first hand the fantastic artistic abilities of Gertrude Sorenson. Gertrude started the resort in 1967 as what was then known as the Bear Trail Inn. Guests at the resorts can view Gertrude’s work in her art studio located on site. She also takes the time to teach painting. Of course at Couples Resort, you can spend the day relaxing in the beautiful accommodations complete with the jacuzzi tubs and many that have private outdoor hot tubs as well. The food is phenomenal and you never have to leave your room as you can have your meals provided by room service. 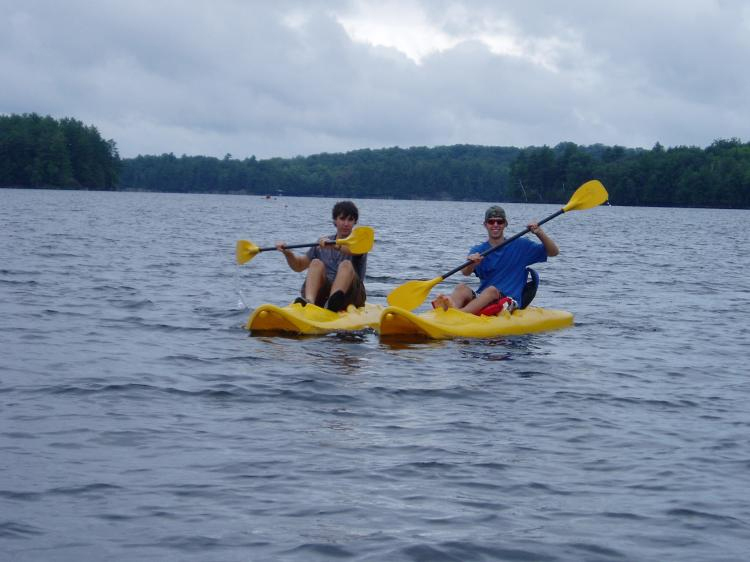 … and head out on the water canoeing or kayaking. With the scorching hot temperatures we have been having lately, I thought I would share at least one great way to cool off; by paddling around the lake. Ontario is home to over 250,000 freshwater lakes and the majority of our resort partners are situated on some of these bodies of water. This gives new and returning guests the perfect opportunity to try your hand at manoeuvering either of these types of watercraft. Before you head out on the water there are a few things you should consider. Make sure the paddle you are using is the correct size for your body. Using a paddle that is too long or short, will make paddling more of an exercise than it needs to be. This is especially important if you plan on going for a long distance. Muscle fatigue can occur quickly and you don’t want to be too far from your original destination that you can’t make the return trip. It’s also worth noting that unless you paddle every day, you’ll be using muscles you don’t normally use. Notify someone of your planned route. This way if you don’t return within a reasonable time, there is someone on shore that knows to go looking for you. If you aren’t sure how to use a kayak or canoe, ask for help. Any fellow paddler I have ever met has always been friendly and open to sharing tips and even experiences. They can tell you areas that are safe and spots to avoid. These are just some of the guidelines to keep and mind and it is always important to ask questions. Afterall when you are staying at a resort the owners and staff want to make sure you make the most of your experience. For more information check out our partners Algonquin Outfitters and The Portage Store for tips and information. While it is a nice way to cool off during the heat of the day, heading out in the morning or evening offers different rewards. Many lakes from Central Ontario to the far north experience morning fog or mist which burns off when the sun comes out. Paddling through the mist presents possibly the most relaxing feeling in the world. If you are out early enough, you’ll feel as if time stands still. Provided there is no wind (which I find for whatever reason is more often the case ,) the waters are so calm it’s like paddling across glass. It is usually silent exception for the sounds of nature, there are rarely any boaters out except for maybe a few fishermen and the loons are active. When out on early morning paddles, I have been welcomed by the haunting call of a loon after it popped up right beside my canoe. Paddling in the evening is again a great experience, in part because once again the fishermen and canoers reclaim the lake from the heavier boat traffic. Paddling as the sun starts to set is an amazing experience. 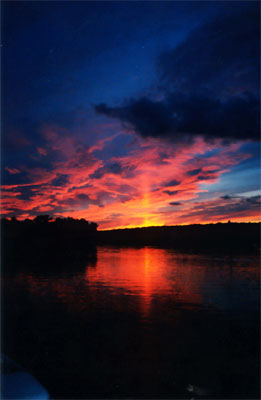 If you time your trip right, you’ll be able to capture the reflection of the different hues stretching across the sky. Just be careful not to be out too late as it can be hard to see your way back when the sun goes down. Over the years, I have been fortunate enough to paddle many different lakes in Ontario. 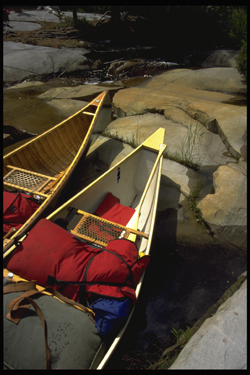 Being in a canoe or kayak gives you access to areas of lakes and rivers that boaters can’t get to. You can also move in closer to shore without much worry about bottoming out your boat. It’s a great way to get stunning photography of natural landscapes, cool off, relax or burn calories. To view some resorts with great canoeing or kayaking click here. School’s out for another summer and that means you are likely trying to figure out what to do with the kids. In an earlier post I mentioned some of the resorts that offer children’s programs but there are also resorts that let you plan your own days events. Our cottage resorts are a great option for reconnecting with your family, with the natural surroundings and are conducive to having fun. From the moment you arrive, you’ll be greeted with a warm welcome and realize this could be the start of an annual tradition. At Bondi Resort in Dwight they are welcoming guests back this week for their 50th summer! Over the years the family has grown and they are now at the point of taking over the resort when they come. Bondi offers a little bit of everything from swimming in the lake, a frisbee golf course, several kilometers of hiking trails, wolf calling, star-gazing and so much more. The team at Bondi knows what it takes to make a vacation memorable and keeping their guests coming back year after year. 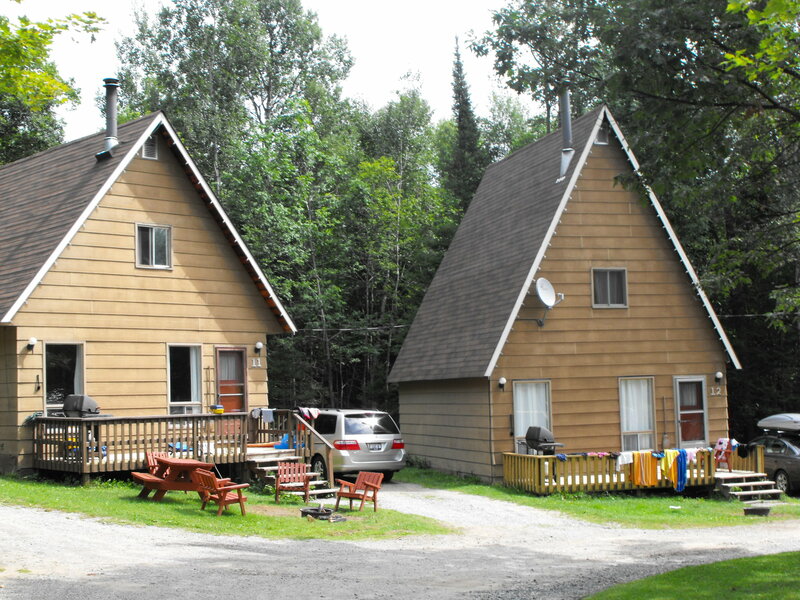 Looking to catch the “big one?” They look no further than Beauview Cottage Resort. In owner Gord’s latest blog post, he shares a picture of some young gentlemen showing off their catch. Speaking from experience, the first bass a young boy catches is the one he will remember for the rest of his life… not to mention it’ll have them hooked on fishing. Beauview also added to their water toys this year with a “Moonwalk” connecting the “Iceberg” to the Water trampoline. At the end of the day, you can soak in a private hot tub or sit under the stars next to a campfire. The 4 season Sandy Lane Resort in Haliburton is another great option for those looking for a kid friendly atmosphere. 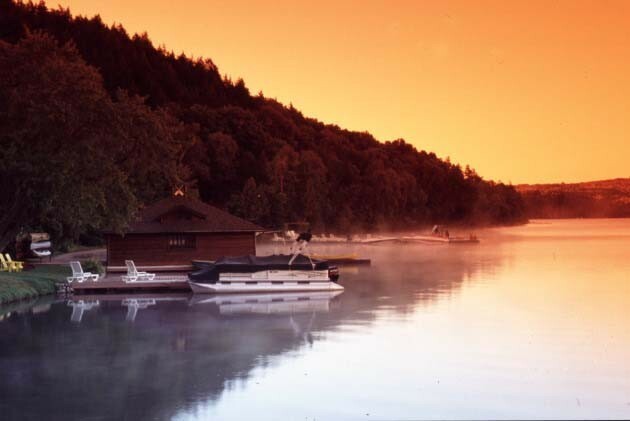 The cottages surround a beautiful park like setting on the shore of Halls Lake. 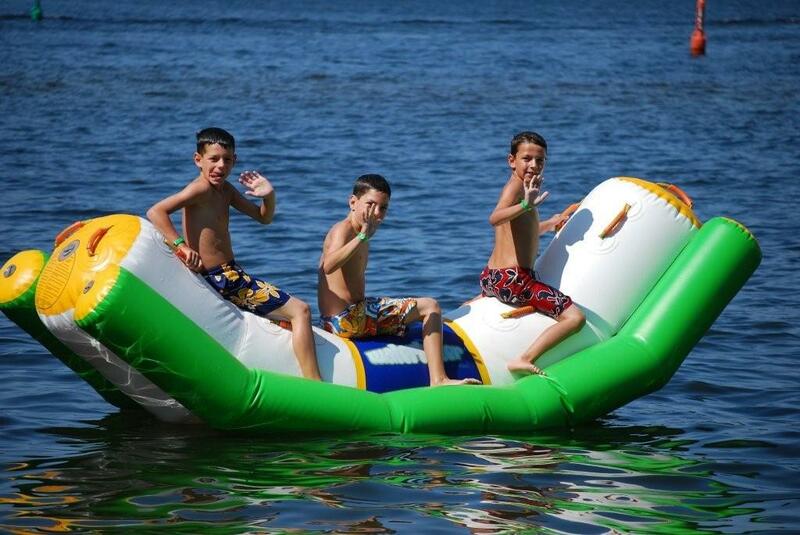 Sandy Lane is ideal for all types of activities and your kids will love playing on their playground equipment, swimming in the lake, or just going out for a relaxing and calm paddle on the water. Heading east towards Ottawa? Then you’ll want to stay Perth’s “Ultimate Family Resort on the Lake,” McCreary’s Beach, which is only 10 minutes out-of-town and only 45 minutes to the nation’s capital city, Ottawa. Pick between staying in one of their charming cottages or condos and enjoy the tranquil setting as you look out onto Mississippi Lake. During your stay, you’ll enjoy use of their Fun Zone, entertainment complex, arcade, tennis courts and so much more. Whether you are looking to go to the near north, towards Lake Huron in the west, or east of Toronto, there are spectacular cottage resorts available. Visit the cottage resort section of our website and start planning your new summer tradition of experience cottage resorts in Ontario. Need a perfect getaway with your kids this summer. Resorts of Ontario can help and in fact, our resorts excel at providing a superior family oriented experience. We specialize in the family experiences by providing kids programs specific to age group. You can rest easy knowing that your child is being cared for by trained staff whose job is to make sure all the kids are having fun. And while your kid is off on daily adventures, you can go for some of your own fun or relaxation by taking in a game of golf, treating yourself to a favourite (or newly discovered) spa treatment, or just sitting in quiet area of the natural Ontario resort settings. Some of the activities your child(ren) will enjoy at our resorts are mountain biking clinics, golf clinics, learning to fish, wakeboarding and waterskiing, tubing, playing games and more. While each resort is different the bottom line is having fun. At Blue Mountain their Kids program, will keep your little one smiling all day with their different themed adventure days, plunges in their pools and even tennis clinics. Kids Korral at Horseshoe Resort, will take your kids through the discovery of something new each day by teaching different activities and skill levels based on the age group your child fits into. Cleveland’s House Resort’s – Cleve’s Kids Club offers “Ontario’s largest and most extensive children’s program.” Here your kids have an emphasis on fun and learning in a safe environment up to 18 years old. At Cleveland’s House, they also have programs to get the whole family involved with their talent shows, amazing family race nights, bon fire nights and more. At Fern Resort, your family will have so many fond memories that you’ll be looking forward to your return visit. Whether you go for the kids programs, the entertainment, dance parties to cooking classes they offer something for everyone. 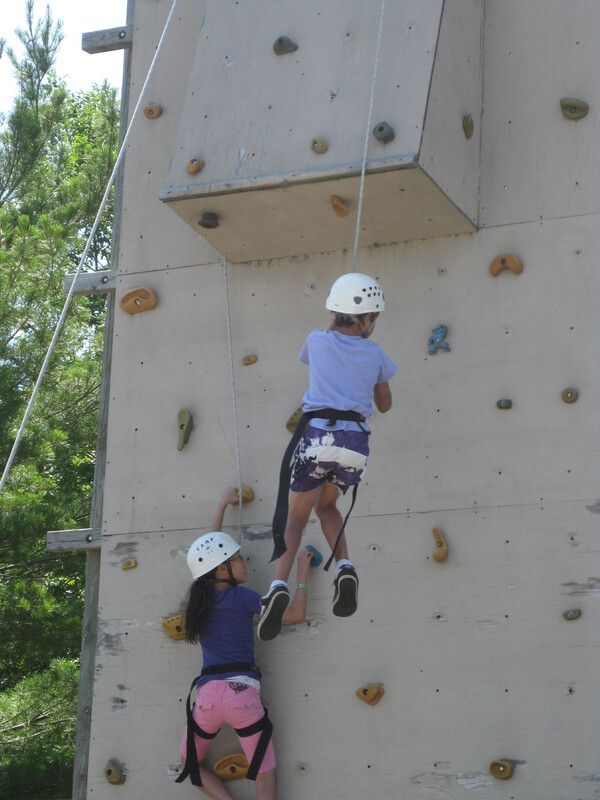 The VIK Club (Very Important Kids Club) at the Delawana Inn, Spa and Conference Resort is a supervised day camp for children ages 3-12 and includes arts and crafts, rock climbing, land sports and water activities, and more. There are several resorts that offer children’s programs and I encourage you to visit the family resorts section of our website. As the day winds down, you can catch up with your kids on their fun-filled day over some of the fantastic meals prepared by the resort chefs. Don’t worry, the chefs still have kids in mind and prepare meals for the palates of youth and adults alike with a variety of menu options to choose from. When you have finished your meal, relax and sit back for some of the nightly entertainment provide which includes everything from water skiing shows, family friendly comedians and shows and even outdoor movies. There is still lots of time left in the summer, so pack the car and come on up to our place for your great family friendly adventure.